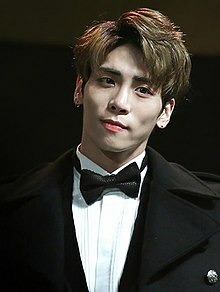 Kim Jong-hyun (April 8, 1990 – December 18, 2017), better known by the mononym Jonghyun, was a South Korean singer-songwriter, and radio host. He was a vocalist of the South Korean boy group Shinee. Jonghyun debuted as a solo artist on January 12, 2015, with his first EP, titled Base. In the same year, on September 17, Jonghyun released a compilation album, Story Op.1. On May 24, 2016, Jonghyun released his first studio album, She Is, followed by his second compilation album, Story Op.2 on April 24, 2017. Jonghyun died in Seoul on December 18, 2017 of carbon monoxide poisoning in an act of suicide at the age of 27. ↑ 1.0 1.1 "샤이니 종현, 쓰러진 채 발견…병원이송 후 사망 확인(2보)". Yonhap News (in Korean). December 18, 2017. Retrieved December 18, 2017. ↑ Mark Russell (April 29, 2014). K-Pop Now! : The Korean Music Revolution. Tuttle Publishing. p. 67. ISBN 978-1-4629-1411-1. ↑ "Shinee singer Jonghyun: K-pop boy band superstar dies". BBC News. December 18, 2017. Retrieved December 18, 2017. ↑ Varandani, Suman (December 18, 2017). "What Is Jonghyun's Cause of Death? K-Pop Band SHINee's Singer Dead". International Business Times. Archived from the original on December 18, 2017. Retrieved December 18, 2017. ↑ "[Update] SHINee's Jonghyun dies in hospital". The Korea Herald. December 18, 2017. Archived from the original on December 18, 2017. Retrieved December 18, 2017. This page was last changed on 26 February 2019, at 05:03.